Who qualifies for the State Contributory Pension and what PRSI contributions must be made in order to meet the requirements? Ger Tyrrell answers these and other age-old questions. Who qualifies for the State Contributory Pension and what PRSI contributions must be made in order to meet the requirements, are common questions many people ask when planning their retirement. In order to qualify for the State Contributory Pension, an individual must have made a certain minimum yearly average of weekly PRSI contributions in the appropriate PRSI Class during their working life. The main sectors of employment that can potentially qualify for the Contributory Pension are private sector employees (PRSI Class A), public service employees recruited after April 6th, 1995 (also PRSI Class A) and self-employed sole traders, partners, and proprietary directors (PRSI Class S). Those who pay PRSI under Classes E,F,G,H and N are also eligible. Workers that don't qualify for the State Contributory Pension are generally public service employees recruited before April 6th, 1995 (PRSI Class B, C & D). However, it is important to note that individuals who have spent part of their working life in the public service and part in the private sector paying social insurance contributions, are deemed to have a 'mixed insurance record' and may still qualify for the Contributory Pension on a pro-rata basis. For individuals who have worked in Ireland and one or more other EU states, the Social insurance contributions paid in these EU States, can be added to your Irish social insurance contributions in order to qualify for the Contributory Pension. Ireland also has bilateral social insurance agreements in place with Canada, the US, Australia, New Zealand, Japan, Republic of Korea and Quebec. These agreements generally provide that social insurance contributions paid in Ireland and the other country can be combined to help people qualify for the State Pension. In general, the method of calculation is similar to the EU rules. Due to the complexities involved, individuals who hope to qualify for the State Pension on the basis of 'mixed insurance records' or social insurance contributions paid in other states should contact the Department of Social Protection to determine their entitlements for this pension. In order to qualify for some level of benefit, an individual must have started paying PRSI before the age of 56. They must also have paid at least 520 weekly contributions, of which no more than 260 of the 520 may be voluntary contributions (a lower limit for voluntary contributions applies if a person commenced making voluntary contributions before 6th April 1997). 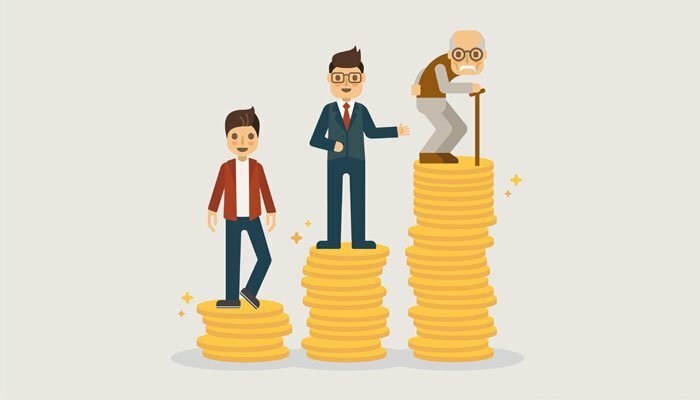 In addition, an individual must satisfy the average yearly contribution limit which can be satisfied where: They have paid a yearly average of at least 48 paid credited or full-rate contributions from 1979 to the end of the tax year before they reach age 66; or they have paid a yearly average of 10 or more credited or full-rate weekly contributions from 1953 (or the time they started insurable employment, if later) to the end of the tax year before they reach age 66. For the purpose of calculation the average contribution for full year is 52 weeks. The State Contributory Pension is payable from a retirement age as determined by the Department of Social Protection. This retirement age has been increased in recent years and could yet be subject to further increases in the future. Currently, for those born in the years prior to and including 1954, the benefit is payable from the date of a person's 66th birthday. For those born between 1955 and 1960, the benefit is not payable until you reach age 67, and for all those born in 1961 and thereafter, the benefit is not payable until your 68th birthday. In order to help provide for your retirement, starting a pension is one of the smartest financial decisions you can make. When choosing a pension, having all the information you need is key. Sound advice is invaluable, so it's a good idea to seek advice from a financial advisor. An independent financial advisor can guide you through the process and help you select the right pension plan for your circumstances. You can find a local financial advisor near you with the Zurich Advisor Finder. Alternatively, the Financial Planning Team can provide you with more information about Zurich's pension plans and options. Ger Tyrrell is a member of the Technical Services team at Zurich Life Assurance. Zurich has a number of tools and tips to help you plan your retirement. The pension and retirement calculator can help you with your retirement planning and will show you how much you need to be financially secure in retirement.